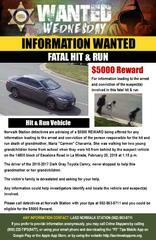 Norwalk Sheriff's Station detectives are advising of a $5000 REWARD being offered for any information leading to the arrest and conviction of the person responsible for the fatal hit and run of grandmother, Maria "Carmen" Chavarria. She was walking her two young grandchildren home from school when they were hit from behind by the suspect vehicle, on the 14800 block of Escalona Road in La Mirada, February 20, 2019 at 1:15 p.m. The driver of the 2015-2017 Dark Gray Toyota Camry, never stopped to help this grandmother or her grandchildren. The victim’s family is devastated and asking for your help. Any information could help investigators identify and locate the vehicle and suspect(s) involved. Please call detectives at Norwalk Sheriff's Station with your tips at 562-863-8711, and you could be eligible for the $5000 Reward.